With the parched Carmel Valley aquifer soaking up most of the Carmel River’s flow, less than 30cfs (cubic feet per second) are now making it into the lagoon. And that’s not enough to overcome the sand piling power of the waves and keep the river mouth open. So the bar is back and the lagoon is refilling. A little rain or a large enough swell to put big waves over the bar and the water will be right back at the doors of the lagoon-bottom homes. 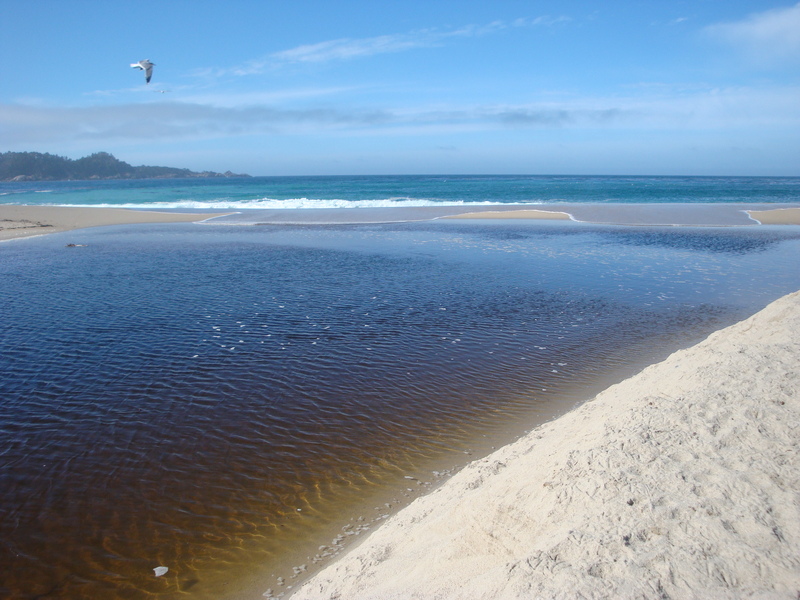 Although many of the lagoon’s juvenile steelhead were probably washed out to sea and killed during Wednesday morning’s draining, we hope, for the sake of any that may be left, that the County will be a bit more proactive if the water rises again, and get to work early enough to do the job right. This entry was posted on Sunday, October 18th, 2009 at 1:29 pm and is filed under Carmel River, Coastal Development/Erosion, Fire, Flood & Apocalypse. You can follow any responses to this entry through the RSS 2.0 feed. You can leave a response, or trackback from your own site.